Back in June 18, 2010, I started taking a photo a day, as part of the Project365 flickr group. I did manage to almost always take one photo per day, but it wasn't until 2013 that I actually fiddled with and uploaded them all. I wondered if I was alone, in being so lax. I grabbed data for all submissions to the group from around 1800 members of the group over around the past two years. The plots below show the results of some initial investigations. 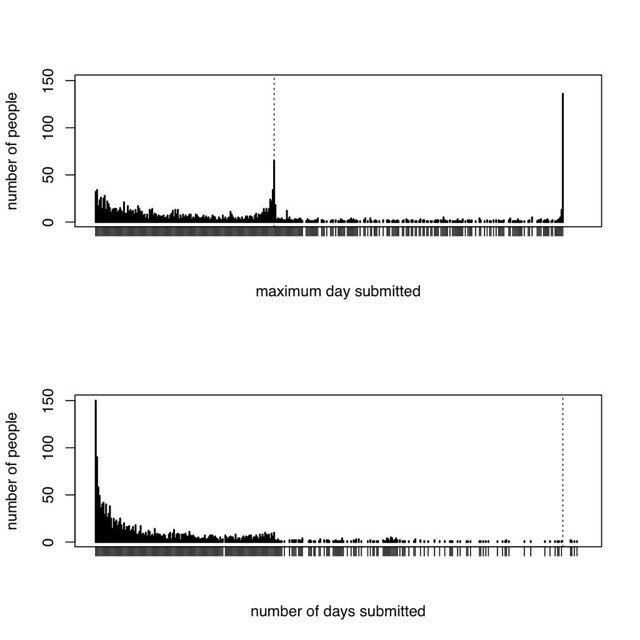 The top graph shows the result of grabbing the maximum day reached by each person, and plotting how many people reached that date. There is a strange peak around 140 (the dotted line) followed by a thinning of submissions, and then a last gasp run to 365 (the peak on the right). The bottom graph shows that most people actually submitted very few pictures; the dotted line on the right marks 365 uploads. Some people submitted more than 365 pictures; this is either a bug in my scripts or some over-enthusiasm on their part.